That is how Nicholas described the day. Even today, he stills talks about it. That is the day that Dream on 3 made a dream come true! What an amazing group of people involved with Dream On 3. From the moment we met them, we all felt like VIPs, and on May 26th, they made sure we were treated as such. To fully understand what this day meant to Nicholas, you must first know what a huge fan Nicholas is of NASCAR. One of the gifts of being born with Asperger’s is that the brain has an amazing ability to stay focused on one subject and remember so many specific details. Nicholas can name every driver, car number, sponsor, crew chief, and just about every winner of each of the races. His dream is to become a commentator for NASCAR, and meet his idol, Darrell Waltrip, a retired driver and current announcer for NASCAR on FOX. Nicholas was so excited about going to the Coca Cola 600 that day, but had no idea of all the surprises that Dream On 3 had in store for us, with an emphasis on the US, because, while this was Nicholas’ dream, the entire family was included, especially Nicholas’ older sister, Morgan. That was so amazing because many times, so much emphasis is put on the child with Special Needs that the sibling feels a little left out. On this day, no one was left out, everyone felt special, and for that, we will always be grateful. So, about the day…first, a huge limo filled with friends, signs, gifts, and more showed up at our home! Then the police escorted us all the way to the track. When we arrived at the speedway, we got our special passes so that we could access all areas. While walking the infield, Nicholas waved to The King, Richard Petty, and shook hands with Mike Helton, President of NASCAR. These were two people whom Nicholas recognized right away and felt honored to have seen. After that, we headed to the motor homes of the drivers, teams, and announcers. As soon as Nicholas saw the sign that said “Darrell Waltrip”, the smile that had been on his face since the limo pulled up, got even bigger! We knocked on the door, and out came Nicholas’ idol! That moment was awesome! The two of them acted like old friends, with hugs, high fives, and smiles all around. There were even some tears of joy from those of us honored enough to witness that moment! 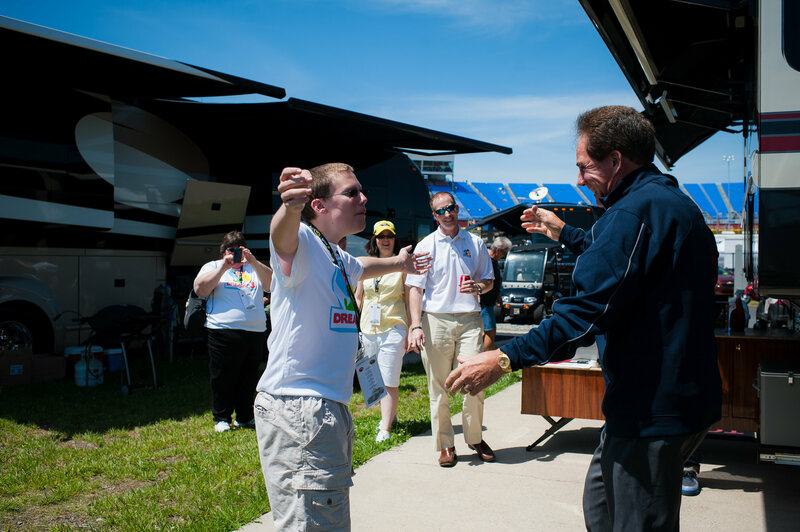 One of Nicholas’ favorite parts was getting to say, “Boogity, boogity, boogity, let’s go racing boys and Danica!” with Darrell Waltrip. Pictures, autographs, and more gifts followed. We could have stayed there all afternoon, but the Dream On 3 team had more surprises planned! The rest of the prerace surprises included an invitation to the Driver’s Meeting, where Nicholas got to meet some more people, including the guys from Duck Dynasty and our Governor, Pat McCrory. We then went to Driver Introductions. Nicholas had a front row spot to give each of the drivers a high five as they exited the stage. Here, he got to see his favorite driver, Jeff Gordon, another dream come true! After that, we were taken up to the Suites to enjoy the race with food, drinks and headphones for Nicholas so that he could listen in on the teams’ radios as they communicated back and forth during the race. What a great way to watch the race. Our limo was waiting for us at the conclusion to return us home. Everyone fell asleep on the ride home, our dreams filled with amazing memories of the wonderful day! Words just cannot express how much this day meant to us. As parents, you love to see your kids happy, having fun, and making lasting memories. Dream On 3 made that possible that day in May. So many days are filled with struggles, frustrations, and worries about what will happen in the future, but on that day, there was nothing but happy thoughts, enjoyment, and smiles. We were so honored to be part of Dream On 3’s first experience, and Nicholas loved being the “pioneer,” as he so appropriately named himself. Many charities focus on making one time wishes come true, but Dream On 3 focuses on fulfilling dreams and helping kids to continue to follow those dreams. In the future, when we hear and see Nicholas on ESPN, Fox Sports, or ABC Sports, we will look back to this moment and be grateful for all that was put into this day to make Nicholas’ dream come true and further his dedication to follow his dream!